The RAM Power Wagon has some great features for 2017. The front grille design make the truck super stylish. The colors, wheels, and lighting of the Power Wagon is inspired by the "Macho Power Wagon" from 1979-80. The new colors are Diesel Gray and Black seats with a tire tread-matching pattern. The features in the Power Wagon include unique 17-inch wheels with 33-inch Goodyear Wrangler DuraTrac. It also gets the RAM "Articulink" front suspension system that includes high movement joints and sway-bar disconnecting system, allowing for additional flexibility and axle articulation. 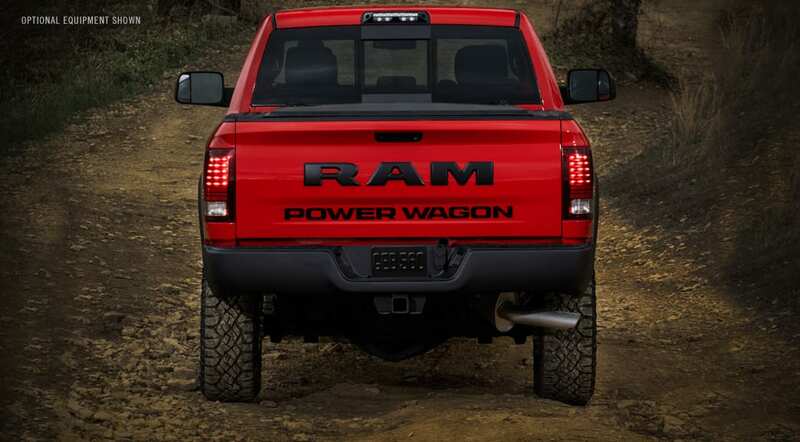 Keep reading below, to learn more about the RAM Power Wagon. The engine that powers the Power Wagon is a 6.4-liter HEMI 16-valve V8. It is rated at 410 horsepower at 5,600 rpm and 429 pound-feet of torque at 4,000 rpm. The calibration enhances its off-road finesse and maneuverability. The truck can be driving in four-wheel drive as "Low" and the throttle response softens and the idle speed increases by 100 rpm which gives added control. The cooled exhaust-gas recirculation will deliver greater efficiency. To add even more efficiency is the revised positive crankcase ventilation system. To combat overheating the V8 engine has a robust/high-volume oil cooler, oil jets for piston cooling, and aircraft grade, stainless steel gaskets and fasteners for improved durability at high temperatures. The RAM Heavy Duty trucks includes a front-axle disconnect system. The front drivetrain components are disconnected to reduce parasitic loss and improve efficiency, even a gain in 1 mpg in fuel efficiency. The five-link coil design gives the truck better articulation over obstacles and the coil springs can handle heavier payloads. The payload can handle up to 1,510 pounds and can towing up to 10,030 pounds. The RAM Power Wagon gets a design like the RAM 1500 Rebel with an all-new grille with prominent Billet Silver "RAM" letter badge. Each side of the grille get black bezel bi-functional projector headlamps with LED marker lights. The hood also has a graphic. The 2017 model gets a thick vertical stripe with "Power Wagon: in a large rotated font. The optional graphics come in two different colors depending on the exterior paint. When the truck is Flame Red, Blue Streak, Bright White, Bright Silver, and Granite Crystal get Gloss Black graphics and when the truck is Black it gets Bright Silver graphics. The interior is offered with two choices and a uniquely designed cabin. It comes with unique technical grain seats that are finished with Diesel Gray and Black with Sedoso fabric inserts embossed with a tire tread pattern. The heated front seats option features Light Slate Gray accent stitching and a RAM logo embroidered on the headrests with Black and Light Diesel Gray Power Wagon nameplate on the upper seat bolsters. Can I schedule a service for my vehicle? What is the ground clearance for the Power Wagon? When it has larger tires and a suspension lift it is 14.3-inch ground clearance. The brakes in the Power Wagon are four-wheel disc brakes. The front rotors measure 14.17 inches in diameter and are clamped with dual-piston calipers. The rear rotors are 14.09 inches that also use dual-piston calipers. All the Power Wagons comes with electronic stability control. There is also an available backup camera in the tailgate. You can check out the 2017 RAM Power Wagon at East Hills!